Last night, I saw my favorite singer of all time, Idina Menzel, in concert. Last night’s happiness just carried over to today. I’m so happy I got to see her in concert, but I am so sorry it’s over. I remember sitting at my computer in November anxiously waiting to purchase pre-order tickets, poised and ready to win a chance to see the original Elphaba (Wicked) in the flesh. My heart was pounding, my feet were bouncing, and my ears were frozen–I had just walked back from class in the freezing November weather. I had my “Let it go” beanie from Hot Topic a top my head for the occasion. I was ready. When I hit the “Buy” button, I went crazy, bouncing up and down in my apartment and screaming because I knew I would get to see her and hear her soaring voice fill an entire concert hall. I called my grandma–she paid for the tickets (Thank you Lille! )–and said my thanks in the most excited, shrill way imaginable. I immediately started a countdown on my phone and took pleasure in watching the days tick by. Now that I’ve attended her concert, I can sincerely say the wait was so, so worth it. Our tickets were in the first balcony with a clear shot of the stage. The minute Idina appeared singing “Defying Gravity,” I had little tears in my eyes. Idina Menzel was in the same room as me! I was there! She hit every note perfectly and she immediately had such a unique stage presence. Every one of the audience members sat at the edge of their seat, hanging on her every word and occasionally “whooping” and clapping when prominent notes or lyrics came along. This moment was so cool–I was in a room with a bunch of people a lot like me. Musical theatre dorks, Disney freaks, and self-proclaimed misfits who all had a soft spot for Idina Menzel. I felt at ease and so excited. By the end of the night, my cheeks ached from smiling so much. I knew Idina was funny, but experiencing her sass while in the same room as her takes my love for her personality over the roof. She politely told an obnoxious fan to “Shut the (expletive) up” and then told the parents of “little girls in blue sequined dresses” to cover their ears from time to time. I laughed so hard, as did the rest of the audience. 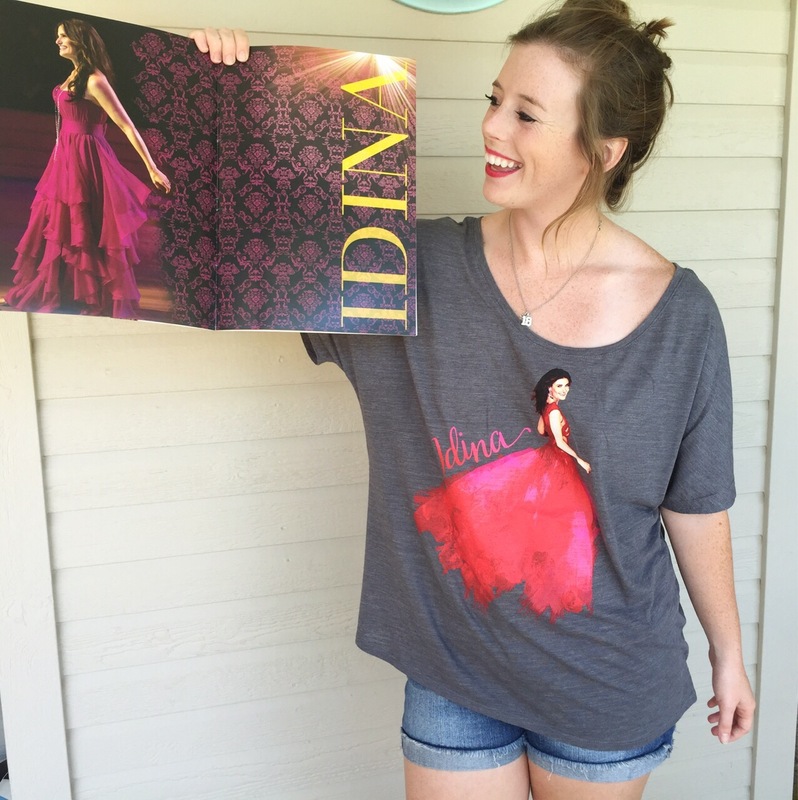 My sister–who was a tad wary of attending an Idina concert, she’s not a die-hard fan like I am–was even red in the face at Idina’s remarks. There was a moment when Idina talked to a fan in the front row who was taking her picture. She insisted on him getting her good side, and laid down on the stage and posed. The audience rip and roared and clapped. She’s just such an entertainer. There were some sweet moments as well. When a little girl yelled out, “I love you!” She smiled and graciously said, “I love you, too.” You can really tell she’s so grateful to get to do what she’s doing, and I couldn’t be more grateful to be a fan of such an incredible person and performer. My favorite moment of the entire show had to be when she sang “Let it Go,” but for a completely different reason than what you might think. Before she finished the song, she invited all the little girls in the audience to go up and sing with her. There was this little girl just one row down from me who was dressed as a little Elsa, and she wanted to go, but her mom was unsure because we were in the balcony. They finally decided to sprint downstairs, and the whole balcony was craning our necks in hopes of getting a glimpse of Little Elsa (the only little girl dressed as Elsa in the entire room) making it to join the crowd of little girls lucky enough to be on the orchestra floor. When we saw that she made it, the entire balcony erupted in cheers. The icing on the cake was when Idina noticed the little girl, and she got to stand right next to her. I completely lost it because Little Elsa was just so excited. Talk about a magical moment in the making–when the little girl came back to her seat, we all clapped for her and gave her high fives. What an incredible memory for that little girl and for all of us first balcony goers. Idina Menzel, if there is any chance you might read this, I want to thank you from the bottom of my heart for putting on such a wonderful performance. 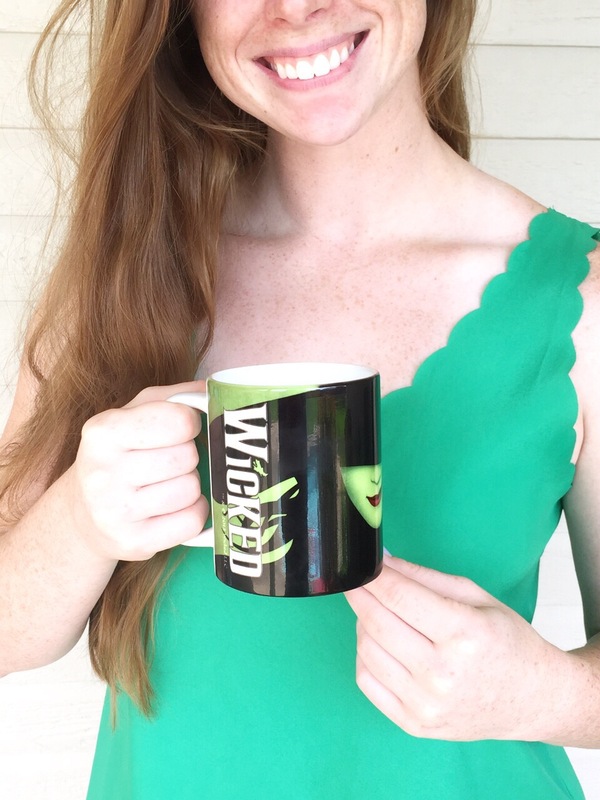 Your songs are apart of my daily life–I listen to “Defying Gravity” when gearing up for volleyball games, “For Good” because it reminds me of seeing Wicked for the first time and crying my eyes out, and Let it Go because I am such a Disney freak and was so happy you were a part of the Disney movie canon. I counted down the days when I could purchase the If/Then soundtrack last year, and I cheered you on when you sang the National Anthem perfectly at the Super Bowl. Thanks for giving us songs to help us feel empowered, motivated, and sassy (Take Me or Leave Me, anyone?). Last night was a dream come true, and I’m so glad I was a part of it. A few days ago, I had the pleasure of seeing Mary Poppins: The Musical for the very first time. A local professional theatre group put on the production, so it wasn’t exactly like the version originated on Broadway. This didn’t make it any less wonderful, however. I loved loved loved the expanded story–yes, it had similar songs and themes from Disney’s movie version, but it also had new songs and characters to create a story unique to its art form. As you watch, you realize flying nannies are completely feasible, chimney sweeps can be guardian angels, difficult tasks and situations can be turned around with a dash of sugary optimism and resilience, and each phase in life is a “step in time” that you are completely capable of handling. The woman who played Mary Poppins portrayed the part “practically perfect[ly]”–her lilting voice suited her role as the Banks’ magical saving grace. I loved her mannerisms: feet turned out in first position, head always held high, every muscle in her body held “just so.” The entire cast was extremely talented, in fact. Bert could tap dance up a storm, and the musical number “Step in Time” just made my desire to learn tap that much more prominent. Of course I love this song. It’s upbeat. Inspirational. Positively optimistic. I also love this little lyric: “No one does it for you…no one but yourself.” I love how this musical emphasizes competence–we all have the ability to be competent in whatever area in life where we are struggling. It just takes realizing that anything can truly happen if we let it. You are in charge of what you do. All the classic songs are also present in this uplifting musical. What made me love the experience, however, was the deeper meaning behind these quintessential Disney numbers. “Step in Time” took on a whole new meaning. The song is affirmation that the chimney sweeps–guardian angels of some sort–are always there when you need them. Each stage in life–childhood, parenthood, etc–is a “step in time” (clever), and whenever you need a little help to get through the tough times, it’s ok to ask for it. Also, Mrs. Banks was not the empty-headed suffragette as the film portrayed; she was a well-meaning mother, wife, and ex-actress trying to figure out how to make things right. By the end of the musical, I rooted for her–she wasn’t just an afterthought. If you haven’t experienced the stage musical, definitely seek to do so. It gave me an expanded appreciation for the flying nanny. In reality, we can all be our own Mary Poppins, and this musical helped me realize that. I am a college athlete. I work out. A lot. Music is definitely the fuel for my workouts, the one thing that helps distract me from the sweat dripping down my forearms (I’m a notoriously heavy sweater when I work out). 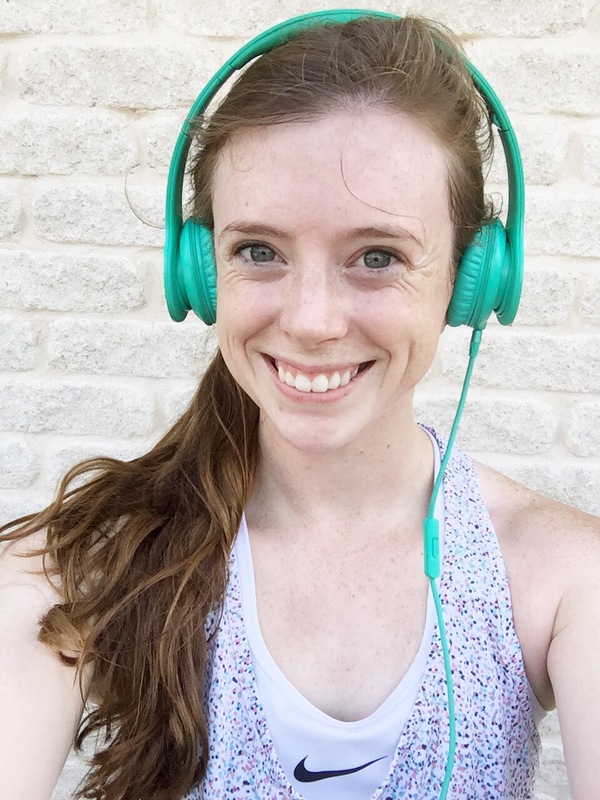 Music inspires me as I make my way through my runs and my weight lifting; lyrics have a way of igniting my soul and passion and focusing my energy on the task at hand. Music can help me focus on the goals I’m pursuing, be it in athletics or in life. My playlist is anything but conventional, however. Remember, I’m a Disney freak/ musical junkie/ Top 40/ a sprinkle of rap kind of girl. I’m not big on the typical “pump-up” songs. I like songs that either carry me away into a story or help me concretely focus on my goals. My favorite workout music definitely varies. The music I listen to as I complete my workouts include music that ranges from slow ballads to epic finale numbers. I’m not kidding. “Go The Distance” from Hercules. Such a good song. Goosebumps, I tell you! “I Can Do Better Than That” from The Last Five Years (movie) soundtrack. Anna Kendrick slays. “Still Hurting” from The Last Five Years (movie) soundtrack. Anna Kendrick pulls at the heart-strings. I can imagine the entire story behind this song, so whatever running/lifting I am doing is a little easier with this gem. “Immortals” by Fallout Boy. Yes, it’s from Big Hero 6, and it’s awesome. My one true favorite “pump-up” song at the moment. “Strong” from the credits of Cinderella (2015). I’m unsure of the artist, but I just love this song. “On My Way” from the musical Violet. I love the latest version sung by Sutton Foster, another Broadway queen I admire. “See You Again” from the Wreck it Ralph soundtrack. So peppy. “Defying Gravity” from Wicked. All time favorite musical with my all time favorite Broadway queen. I literally (Chris Traeger voice…ten points to you if you caught the reference) get goosebumps during my run when this song starts to play. All the feels accompany this song. Love you, Idina. “Love Me Like You Do” by Ellie Goulding. Solid Top 40 song. “There’s a Great Big Beautiful Tomorrow” from the Carousel of Progress in Walt Disney World. So positive. So wonderful. It makes me want to better myself for the good of tomorrow. With the right music, you can learn to enjoy (or tolerate) your workouts as well! If you enjoy a good pump-up song, go for it. If you tend to listen to symphonies as you run, don’t feel self-conscious when you’re on that treadmill in the gym. Do what’s best for you. Even if it means blaring “Anything Goes” (from the musical Anything Goes) as you do your squats next to a very intimidating dude with muscles popping unnaturally out of his shirt. That example was based on a true story. Have a wonderful day, my friends! I hope my eclectic playlist inspires you to get moving and to get inspired by the music you choose. Remember, you don’t have to be perfect in your athletic endeavors. You just have to make the decision to try. Still smiling after my run, drenched in sweat and listening to my tunes. I saw Into The Woods yesterday…and the day before. I absolutely LOVED it. I’m such a musical fan, and when a musical can encompass both fairytales and smart little lessons, count me in as one of its biggest fans. The whole cast was fabulous, the whole soundtrack is wonderful, and I am now obsessed with the song “No One is Alone”–someone is always on your side, and, then again, someone else is not. I just love when lyrics of a song–little hidden poems of wisdom–convey so simply the facts of life you never even thought about. Little Red Riding Hood, after her encounter with “Mr. Wolf,” can frankly say, “Nice is different than good.” This. Is. So. True. If you haven’t heard this song (“No One is Alone”), please look it up. I just love it so much. I feel like some of my favorite musicals convey a similar theme. Wicked, for example, confirms that just because someone is called “Glinda the Good,” a mere title doesn’t make them a good person–of course, Glinda comes around in the end…sort of. Everyone has the potential to be good–you just have to decide to be good for yourself. Wicked also was one of the first examples of a misunderstood villain/hero I’ve ever encountered–I felt like I was Elphaba, always striving to “make good” yet always feeling as if I had fallen short. That’s another thing about good people: they try so hard to be good, even if they mess up along the way. Anyways. See Into the Woods. Not only is it Disney, but it is also an adaptation of a musical that has easily become one of my favorites of all time. This is saying something, because I am definitely a musical junkie. Get lost in the rich songs that tell of what it means to be good, and assures you that you will never be alone. I loved it. Go see it.